Bill Lee encountered a problem that many card collectors have faced. There was a specific card he was after, but he did not know where to find it or what a fair value would be to obtain it. 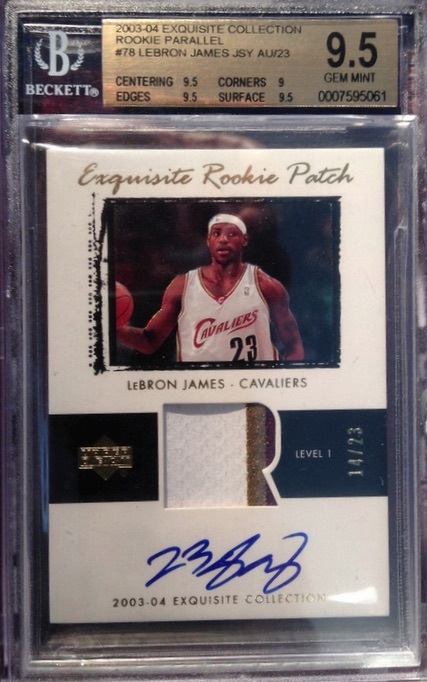 However, the main difference between Lee and the average collector is that the card Lee desired was a high-grade, 2003-04 Exquisite Collection LeBron James rookie card that came with a $95,000 price tag. An experienced Silicon Valley venture capitalist and angel investor, Bill Lee is no stranger to big purchases with risk attached. In order to limit risk, he always tries to live by his motto, "When people make any type of investment, they should do their research!" However, compared to his many other investments, simply buying a nice card seemed to be a relatively easy task. After months of searching, Lee soon realized that the high-end collecting world is a bit more complicated. Bill Lee had been many things in his life, but a card collector was not one of them. He isn't like many collectors who started off as a kid, lost interest in their teenage years and then came back in their 20s and 30s. Lee's initial foray in collecting came from an investment perspective as an adult and, to him, LeBron James represented the investment with the most upside and the least risk. Lee expounded on this by adding, "As a Silicon Valley venture capitalist, I have learned that you should always focus on the market leaders. So, instead of speculating on up-and-coming players, I decided to purchase the most prominent active player today in basketball. That person is clearly LeBron James. I believe that buying LBJ will appreciate the most since he is undoubtedly the face of the NBA and the most dominant player today. I also believe this protects my downside as there will always be a market for James as he is truly a generational player. Some collectors may wonder why Lee chose LeBron James over Michael Jordan. While he greatly respects Jordan and his relevance to the hobby, Lee believes the newer period of collecting will always be associated with LeBron James and that is where the greatest chance for growth is found. Lee further stated, "I think it is important to identify when trends appear in the hobby and the auto patch is clearly the new trend and will always represent a milestone to collectors." Lee's positive outlook is not just limited to LeBron James, but the league as a whole. "The global presence of the NBA is only going to expand and this will continue to create new legions of card collectors and NBA fans. I also believe that the NBA is the one sport that can transcend international borders and become an international phenomenon." Once Bill Lee identified LeBron James as the best investment opportunity, his decision to pursue the 2003-04 Exquisite Collection rookie card was an easy one, saying, "I believe that Exquisite kicked off the modern card collecting era with the 2003-04 LeBron James rookie card and it will become a generational investment." Lee also is not worried about the future of the industry having any effect on the market for card because "You can never re-create the LeBron James Exquisite Collection rookie. That card and its vintage is already identified with collectors as the prime real estate for its generation. In 100 years, Panini, Topps, etc..., can all be forgotten. However, LeBron James will still be a basketball legend and owning a piece of his legacy will be a significant investment." 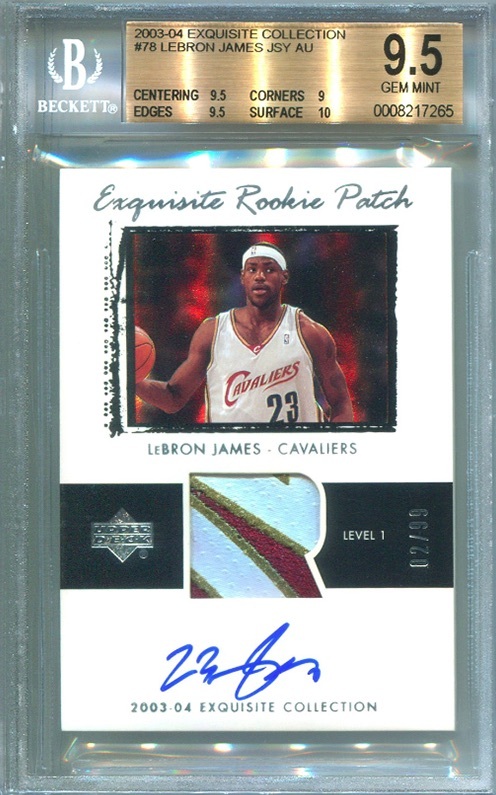 The main problem for the majority of premium cards, including the 2003-04 Upper Deck Exquisite Collection LeBron James rookie card, is a limited supply. Numbered to 99, it is the LeBron James rookie card and has been since the product was released over a decade ago. As of the most recent population reports from BGS and PSA, approximately 80% of the 99-card print run has already been graded, and most are likely tucked away in private collections. While current prices are firmly in the five-figure range, there is still plenty of room for growth as LeBron James enters his prime years. Because of this, most that own the rare card are not actively trying to sell as conventional wisdom says the value will continue to increase. In today's collecting world, most of us start our card searches online. Bill Lee did the same in the summer of 2014, beginning with the online forums dedicated to card collecting. Next he moved to the option most frequented by card collectors looking for singles, but eBay offered little for Lee given the overall rarity of the card and high value. While both yielded some possible leads, it became clear that even when cards were "available" for purchase, it was never that simple. Lee ran into a curious problem while trying to track down a 2003-04 Upper Deck Exquisite LeBron James rookie card. He'd be working out a deal with a seller only to find out they didn't actually possess the card. They'd say they had one and then attempt to buy one and flip it for a higher amount, more or less like a middleman or broker. This is a common theme in the high-end collecting world and killed many deals because the "seller" would delay things as he attempted to actually acquire the card. To combat this, Bill Lee employed a helpful tactic that he dubbed "proof of life." Once he identified an available card and the price negotiations had progressed, Lee would request a photo of the card that included his name and the current date on a sheet of paper. It's not foolproof, but this helped him weed out many of the imposters. It also gave him more piece of mind about such a large purchase. The next problem that surfaced was the actual payment. When dealing with so much money and sellers that span the globe, there is no specific system in place to facilitate the process with guarantees for both parties. According to Lee, "Deals fell apart because we couldn't get comfortable on how to actually pay or receive the card. For example, I had a couple of sellers ask me to pay in all cash. I didn't feel comfortable flying with that amount in cash. If I could get a seller to agree to a wire, I still needed to be certain they would actually ship the card." Although more generic options exist, Lee feels the industry needs an escrow service that caters specifically to high-end cards. Even after all this, Lee did not have the LeBron James rookie card and did not seem any closer to actually owning one. Lee also found the market to be very "clubby." Sellers and buyers are reluctant to deal with those that are not known in collecting circles. "You have to have street cred in order for sellers to ship your merchandise. You need people to vouch for the buyer and seller so both parties can feel confident that a transaction will be consummated," Lee added. As is the case in most business dealings, if there is no trust, then there is not going to be a deal. This makes it especially difficult for a new collector to break into the high-end world. After months of work with no success, Lee shifted his focus to his new connections in the industry. His time searching on eBay led him to Wesley Love, a seller who operates as toprooks on eBay. First a source of information and then an advisor, Love would eventually become Lee’s card broker. This relationship finally led to a breakthrough, but there were still some bumps along the way. According to Lee, "The market for the LeBron James Exquisite rookie card is so thin that triangulating the price was more art than science. The main thing we heard when trying to find the card was 'The seller doesn't want to sell,' so there was an art to convince these people to sell. We also chased a lot of false leads and people trying to make a fast buck by flipping cards they didn't have. Like any industry, I learned there are a few hucksters in the business." 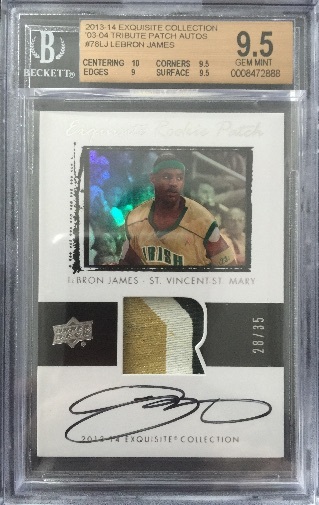 The original plan was to buy a BGS 9.5 copy of the main 2003-04 Upper Deck Exquisite LeBron James autographed patch rookie card, numbered to 99. However, an opportunity arose for Lee to get a BGS 9.5 card of the jersey number parallel (#/23). He wasted no time on securing his card. Although more than half of the 23 cards have been graded by BGS, this is the only one to get the 9.5 grade. With all dealing done between Wesley Love and the seller, negotiations started with a $60,000 offer. It took eight weeks of offers and counteroffers, but a deal was finally made in January of 2015. Lee would get the card for $90,000 plus a 2007-08 SP Authentic Kevin Durant Retail Rookie Autograph. Numbered to 10, the card is worth about $5,000, and put the total amount at roughly $95,000. According to Lee, the Durant card was added because "people want to trade for other hard to find cards so you get more value than cash." "I'd sum up my excitement by stating that it feels like a tremendous sense of accomplishment and pure joy. The card is such a beautiful piece of art and sports history. After going through so much to finally get the LBJ, I realized that I was really buying a piece of history and so lucky to be its new custodian. I guess the best expression would be that I don't feel like I own the card; I feel like I'm taking care of it for the next generation." And even if James brings a few titles to Cleveland, don't look for this particular card to return to the market anytime soon. "I’m not a seller and will probably never sell the card," he said. This does not mean that his purchase was based on anything but an investment mindset. Lee believes one day the card could be worth $500,000. "It has the potential to be the next T206 Honus Wagner or 1952 Mickey Mantle card," Lee said. Bill Lee intended for the LBJ card to be his only interaction with the hobby, but he was hooked by the collecting world and now has plans to build a world-class collection. Lee has moved quickly, finally securing the elusive base Exquisite Collection rookie card for LeBron James (#/99) in April. He was able to obtain a BGS 9.5 version thanks to buybuymj, another acquaintance from eBay. Lee is also now the proud owner of several key one-of-one rookie cards for a variety of basketball players that can be viewed in the gallery below. His collection is not just limited to the NBA and he has added a few Andrew Luck cards as well. Check out Bill Lee’s blog, Back to Reality. You can also follow him on Twitter. 2003 Bowman #123 Lebron James Rookie Card GMA 10 Gem Mint! 2003 UD Top Prospects LeBron James Promos #P2 "REDUCED"
2003 04 topps rookie matrix LeBron James rookie card W Anthony. Really good article. Thanks for posting thiS! There are only a few historic cards that will be gold standard for the hobby and the James UD rookie is basketball’s. Only Brady’s and Manning’s I see increasing exponentially. Unfortunately manufactures are overproducing so many autos and products that only the all-times will be big money cards. The whole hobby is self consuming itself with the demand for autos to sell to get back the money they spent on overpriced products. Which only increases the supply and simply due to supply and demand will over time decrease card values as demand decrease. With thousands and thousands of autos of players being pumped out today. The value and quality of the cards will continue to fall. I just looked at Bill’s blog. He truly is the most interesting man in the world. Great article! Thanks for posting this! His story sounds similar to mine. There was a graded LBJ RC /99 on ebay that I so desperately wanted, but unfortunately the original owner of the card does not ship to Canada and refused to respond to my emails regarding shipping. So I contacted a very well known high-end seller on ebay if he’d be willing to purchase the card for me instead. 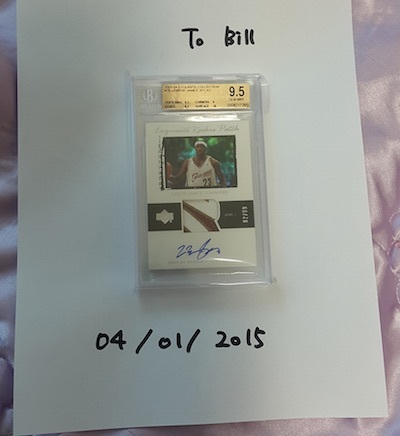 And because i’ve purchased from the seller before in the past and built up a relationship with him, he trusted me and made an offer on the LBJ card that the owner accepted and sent the card to him. Once he received the card, he then gave me a chance to purchase it from him, agreeing to my offer and shipped the card out across the border to me. Now i’m a very happy and proud owner of the Lebron James rookie card! 2003-04 Skybox Autographics RC Lebron James BGS 9.5 1500 Low Pop Of 12 Rare!